Midtown Toronto has once again been transformed into a Latin cultural extravaganza. The summer's hottest salsa street party, Salsa On St. Clair, plays on for its 14th consecutive year. 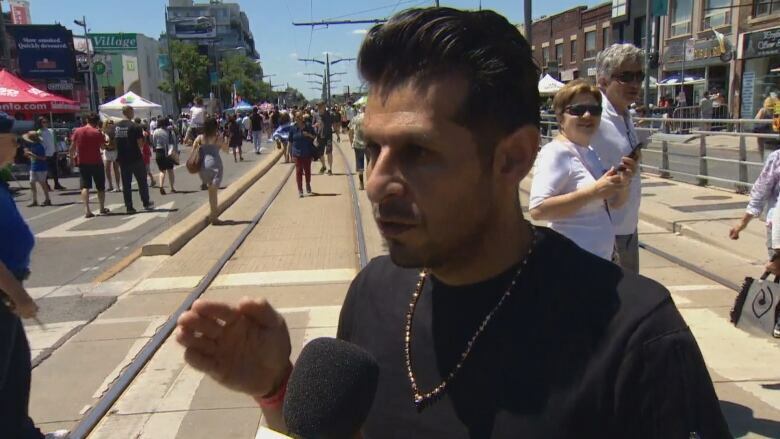 Midtown Toronto has once again been transformed into a Latin cultural extravaganza as the summer's hottest salsa street party, Salsa On St. Clair, plays on for its 14th consecutive year. The month-long festival features live music, dance lessons, Latin food, family fun and lots more. Ivan Wanis Ruiz, one of the event's ambassadors, says the festival is for everyone. "One of the great things about coming together with salsa is that you don't need to speak Spanish to love it," Wanis Ruiz told CBC Toronto. "When you walk through the streets here . . . you will see people from every background. They are all coming together and sharing the language of dancing." Wanis Ruiz said that in addition to food, the great smell in the air, live music and great entertainment, the thing that makes the festival really special is that on every corner there's a dance floor. Meanwhile, CBC Toronto's Dwight Drummond and Metro Morning's Jennifer Allen were on the main stage Saturday afternoon for a very special CBC Toronto dance lesson.